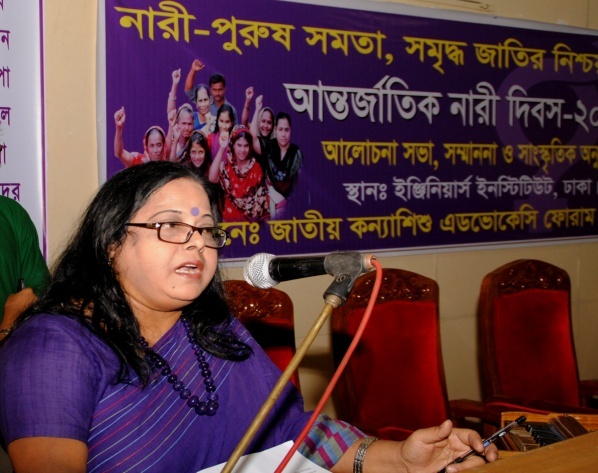 International Women’s Day has been observed across Bangladesh as elsewhere in the world, with women raising their strong voices with the theme of- “Equality for women is progress for all” in this year. 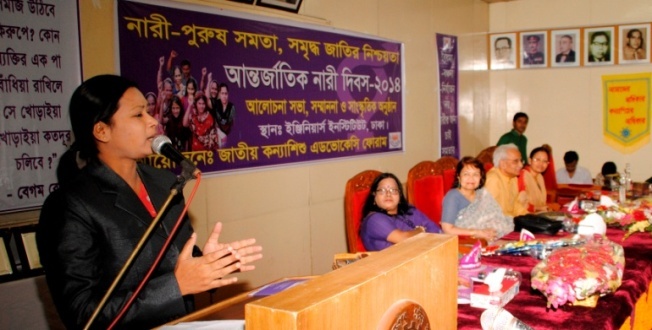 The National Girl Child Advocacy Forum (NGCAF) and The Hunger Project-Bangladesh have jointly celebrated International Women’s Day on 8th March at 354 places throughout Bangladesh. 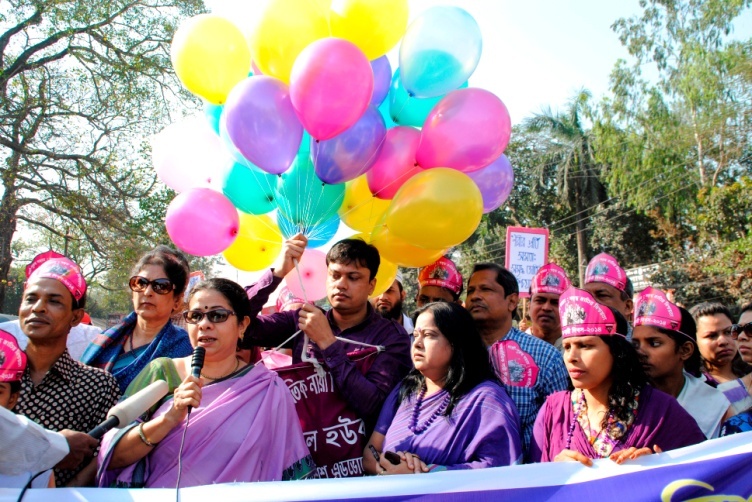 A central event organized in Dhaka was followed by a huge rally, discussion meeting, special award giving ceremony to those women who are contributing for women development, a cultural program and the dissemination of posters and leaflets. 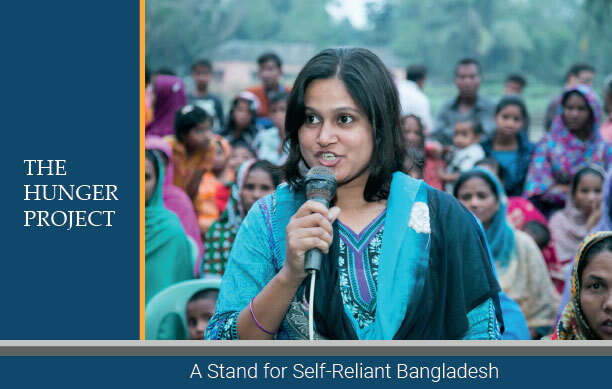 The program sparked off with a rally, inaugurated by Ms. Rasheda K. Chowdhury, Ex- Advisor, Caretaker Government of Bangladesh and Executive Director, Gono Shakkhorata Ovijan (CAMP) at 9.00 am from the National Museum, Shahbagh compound. 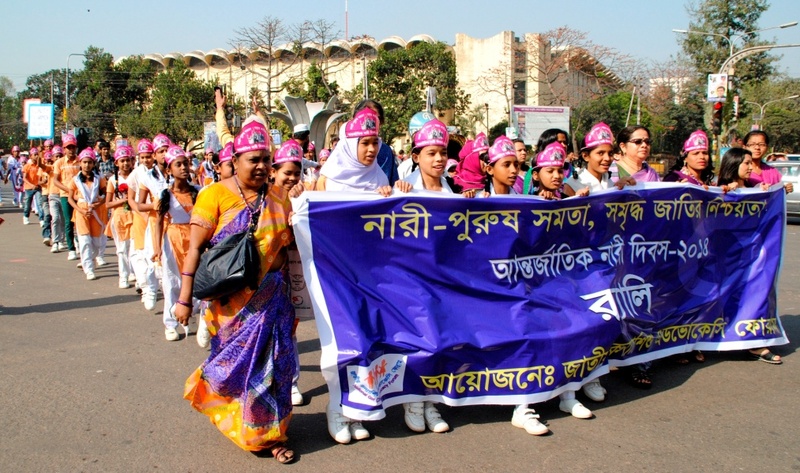 A kilometer- long procession, led by women and girls in traditional apparel holding the banner with the participation of approximately 1,800 men, women, adolescent girls and boys from 56 organizations and institutions, waving placards inscribed with slogans including ‘Stop violence against women’, ‘Implement the 2011 National Women Development Policy’, ‘Ensure security for women in all sphere of their life.’ The marchers travelled towards Engineers Institute, Dhaka chanting slogans like ‘Equality of men and women makes progress for a nation’, ‘Ensure human rights’, ‘Implement the CEDAW charter’, ‘ Ensure gender equality in every sphere’ etc. The rally was exciting and colorful. After the rally, all participants joined a discussion meeting followed with guests of honor featuring Chief Guest Dr. Rounaq Jahan, political scientist, Nasima Akhter Joly, Secretary, National Girl Child Advocacy Forum chaired by Dr. Badiul Alam Majumdar, Country Director and President of National Girl Child Advocacy Forum. The central theme of the discussion was “Equality for women is progress for all”. All the discussants expressed their viewpoints on the central theme and called for ensuring equal rights for women and girl children in all spheres of the society. 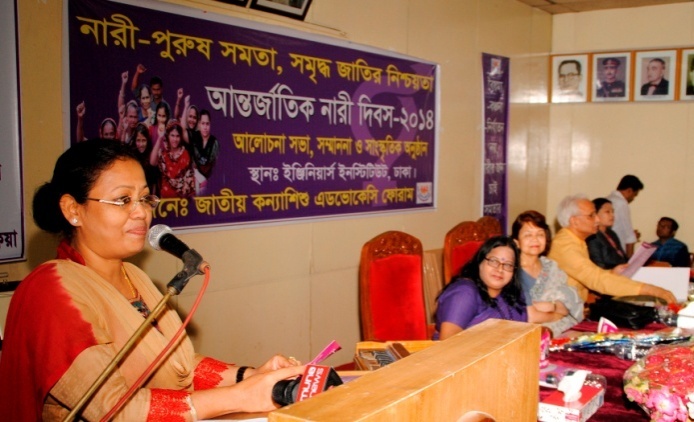 In her welcome address, Nasima Akhter Joly, Secretary of NGCAF stated that women will indeed achieve equality in every sphere – that day is not so far off. Today’s women are so hard working and self confident that they will reach their destination. The chief guest Dr. Rounaq Jahan stated in her speech that with women’s contribution, a nation can progress, and that if we do not ensure women’s dignity and equality than it will be impossible. For that we need to raise the strong voice of women to uphold their dignity and equality. 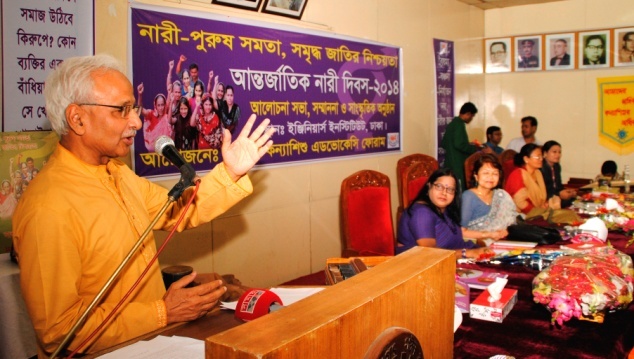 Dr. Badiul Alam Majumdar chaired the discussion meeting and said in his presidential address that we are committed to ensure equality for women and for that we need to change our patriarchal mentality right now. The National Girl Child Advocacy Forum showed honor and appreciation to two distinguished women for their significant expertise and achievements in respective fields by giving awards. The honorable awardees are- Rowshan Ara Begum Deputy Inspector General (DIG), Criminal Investigation Department, Bangladesh police. She is also the president of Bangladesh Police Women Network. She had nominated for “Officer of the Year” for IWAP- International Association of Women Police Annual Award Program in 2013 and got scholarship. Another personnel is Ms. Rehana Parvin obtained Bronze Medal as a player participated in the 10th SAF Games Women Kabadi Competition held in Srilanka in 2006. She also had participated in the Qualifying Round Women Football Competition held in New Delhi, India in 2006. The chairperson and the chief guest respectively presented them crests bearing citations of their achievements. 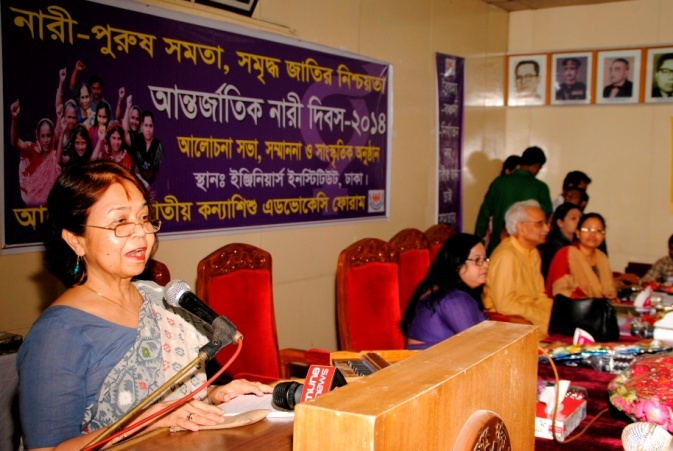 Acknowledging speaks of the honored Rowsahan Ara Begum said “We need to give value and attention to women’s contribution in every sphere of the society. She also said that in International women’s day, we celebrate the day, evaluate our achievements and make us more confident and self-reliant. Narrate her own experience Ms. Rehana Parvin acknowledging and said “My dream; the presence of women will be in every where, even one day women will do referring in a football match of world cup also”. In the event, a THPB publication titled Narir Kotha-9 (Voice of Women-9) and a poster had been inaugurated by the attended guests. The whole program ended with a beautiful Bangladeshi cultural demonstration. The organization that attended the rally and discussion meeting were USC- CANADA, The Hunger Project- Bangladesh, SUROVI, TMSS, CARITAS Bangladesh, ASD, Nari Maitree, ASF, Rights and Sights for Children (RSC), BNWLA, YWCA of Bangladesh, Good Neighbors’ Bangladesh, Aparajeyo Bangladesh, ASAUP, Dustho Bekar Kallayan Samitee, Aparajita Nari Shangathan, Arnab Health Education and and Environment Development Foundation, AIDF, Action in Social Development, Eventful Bangladesh Society, Islamic Relief Bangladesh, UDDIPAK,H.S. Education and Health Society, Work for a better Bangladesh, Koinonia, Child Development Forum, Dhaka Ahsania Mission, Nebula Human Development Society, National Youth Council of Bangladesh, Plan- Bangladesh, Bhuya Foundation, Mayer Dak, CCDB, Steps towards Development, SAP- Bangladesh, Arai Hazar Jono Shanggha, Akota Dustho Mohila Kallayan Samitee, Chetona Mahila Shanggha. The event was covered by major broadcasting channels, like ATN Bangla, Channel eye, Boishakhi TV, Shomoy TV, Desh TV, SA TV, Jamuna TV etc.